The California Department of Fish and Wildlife (CDFW) will hold a public meeting on Monday, Aug. 17 to inform the public about the proposed emergency closure of the Merced River to fishing. The meeting will be held from 7-9 p.m. in the theater at El Capitan High School, 100 West Farmland Ave., Merced (95348). Last year the California Fish and Game Commission adopted a proposal to implement early restrictions on angling in the Merced River, closing the river from Aug. 29 to Dec. 31, 2014. Earlier this year, the Commission granted CDFW authority to close fisheries when certain criteria are met, such as low water levels and high water temperatures. This proposed early closure affects only the Merced River from Crocker-Huffman Dam downstream to the Snelling Road Bridge, a distance of approximately 5.5 miles. Angling in the river below Snelling Road bridge is subject to normal fishing regulations and closures.. The lower Merced River is typically only closed to angling from Nov. 1 through Dec. 31. The purpose of the annual closure is to increase survival of juvenile and adult wild rainbow trout and steelhead by reducing fish mortality associated with hook-and-line fishing. The move to close the river ahead of schedule is intended to protect drought-stressed waters and their salmonid populations during the fall spawning. The river will re-open to anglers on Jan. 1, 2016. The California Department of Fish and Wildlife (CDFW) announces the recreational Pacific halibut fishery will close Thursday, Aug. 13 at 12:01 a.m. for the remainder of 2015. 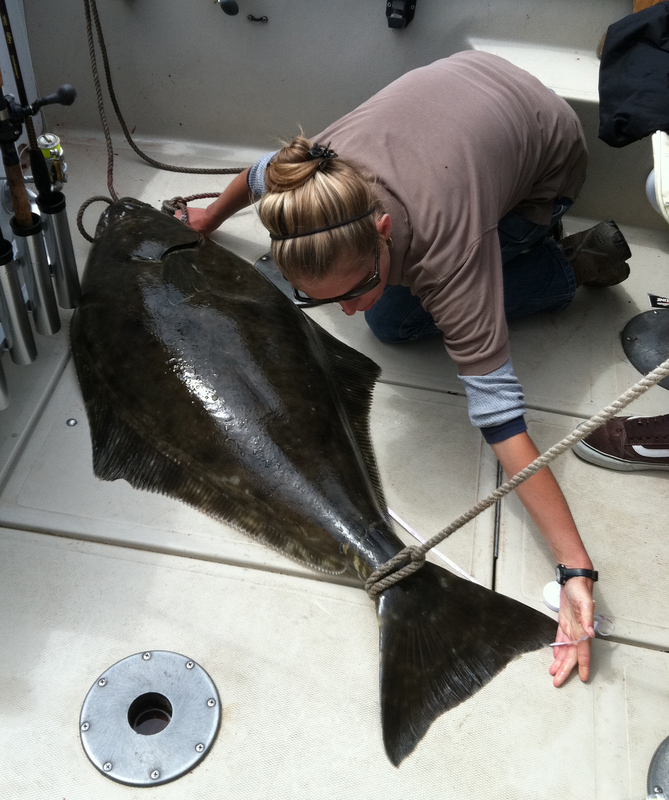 The last full day of Pacific halibut fishing will be Wednesday, Aug. 12. A technician with the California Recreational Fisheries Survey measures a Pacific halibut. CDFW file photo. Based on the latest catch projections, CDFW expects the 2015 quota of 25,220 pounds will be exceeded unless the fishery is closed. Authority to close the fishery resides with the International Pacific Halibut Commission (IPHC) and the National Marine Fisheries Service (NMFS), which took action to close the fishery following consultation with CDFW. Although poor weather limited fishing following the May 1 opener, excellent ocean conditions during the July 1-15 open period resulted in record Pacific halibut catch rates for California. California’s recreational quota and season dates for 2015 were the result of negotiations with anglers, the fishing industry, local community leaders and other state and federal partners. Beginning in 2015, CDFW committed to tracking the fishery during the season to ensure catch amounts would not exceed the California quota. The quota amount is determined annually, and is largely driven by results from the annual stock assessment conducted by the IPHC. Pacific halibut occupy a large geographic range, from the Aleutian Islands eastward through Alaska to British Columbia and throughout ocean waters of the Pacific Northwest. Along the West Coast, they are commonly found as far south as Point Arena in Mendocino County. In recent years, catches in northern California have increased, consistent with a general shift of the stock to the south and east. CDFW field staff sampled public launch ramps and charter boat landings to monitor catches of Pacific halibut along with other marine sportfish throughout the season. Using this information, CDFW conferred with NMFS and IPHC on a weekly basis to review projected catch amounts and determine when the quota would be attained. The Putah Creek Wildlife Area in Solano County will be closed until further notice due to impacts from the Wragg Fire. The Wragg Fire has burned 8,051 acres in Napa, Solano and Yolo counties, including the entire Putah Creek Wildlife Area. The closure affects all public uses including, but not limited to, hunting, fishing, hiking and nature viewing. The closure is intended to allow the landscape and wildlife to recover, minimize erosion, and ensure public safety. As a result of the fire, potential hazards such as loose rocks and falling tree branches exist in the area. CDFW will reassess the Putah Creek Wildlife Area in spring 2016 to determine if it is suitable for public access. Putah Creek Wildlife Area is located in Solano County just east of Lake Berryessa. For more information on the Wildlife Area, please visit https://www.wildlife.ca.gov/Lands/Places-to-Visit/Putah-Creek-WA. The Cache Creek Natural Area is closed to all public use and access until further notice due to the Rocky Fire burning in Lake, Yolo and Colusa counties. This closure affects state lands managed by the California Department of Fish and Wildlife (CDFW), including the Cache Creek Wildlife Area, and public lands managed by the Bureau of Land Management (BLM), including the Cache Creek Wilderness Area within the Berryessa Snow Mountain National Monument. Additional closures are in effect at the Knoxville Wildlife Area managed by CDFW and the Knoxville Recreation Area managed by BLM. Road closures are also in effect. The Highway 20 corridor is closed from Highway 53 to Highway 16, both directions of Ogulin County Road, and Highway 16 is closed from Highway 20 to County Road 41. Jerusalem Valley Road is closed to all traffic at Spruce Grove Road. CAL FIRE is urging motorists to stay vigilant and adhere to frequently changing evacuations and road closures. Due to significant fire activity, it is unknown when the areas will be safe to reopen. For more information about the closures, please call CDFW’s North Central Region at (916) 358-2900 or Rocky Fire Information Center at (707) 967-4207. The message will be revised as more information becomes available. For current updates on the Rocky Fire, please visit the CAL FIRE Incident Information website, http://cdfdata.fire.ca.gov/incidents/incidents_details_info?incident_id=1161.